Discussion in 'Online Casino Promotions' started by Marina, May 2, 2016. In an industry as competitive as the world of online gambling, it is always refreshing to hear about online casinos which not only survive past the first few critical years, but also go on to improve with age. Guts Casino is one such site, which has continued to bring fresh games and promotions to its players in the three years that it has been around in the market. 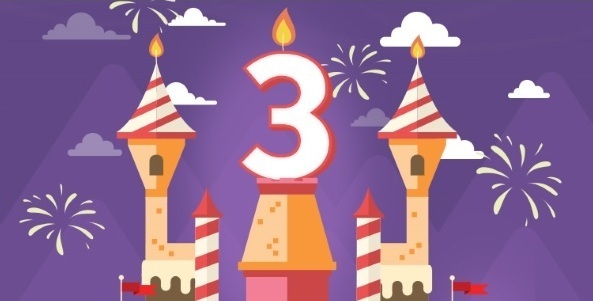 This month, Guts Casino turns three and to celebrate this significant milestone, the online casino is giving players the opportunity to win big. The Third Year Birthday Bash kicks off on May 2nd 2016 with a Guts Turns 3 – The Magic Number is 3 promotion – and you are invited to join in the fun and become the star of the party! So what type of party favors are being handed out by Guts Casino during its special birthday month? There will be 3 grand prizes (more about that later) to be won, as well as a whopping 300,000 free spins on top slots. In addition, Guts Casino will be giving away three weekly reload bonuses and 300 cash prizes! Did someone say three? In order to get your foot in the door of the party running at Guts Casino, you will need to opt in to the Guts Turns 3 promotion. For each EUR 30 you deposit into your real money account (or currency equivalent) and wagered on any casino game available at the site, you will be awarded one lucky raffle ticket. This ticket gives you a real chance to either win a weekly prize offered by Guts Casino or one of the three grand prizes up for grabs. Grand prize number one is a dream trip to Malta. The second prize is a free spins package which will see you enjoy free spins on slot games every single day for the rest of the year! The third grand prize is a dinner for three people, as well as 3 VIP tickets to a local event. Please note the following terms and conditions of the latest Guts Casino promotion. and all of the tickets are taken into account for the Grand Prizes raffle which will be held on Guts Casino’s birthday on May 22nd 2016. Guts Casino will distribute free spins and cash prizes on a totally random basis to players who come from non-restricted bonus countries. The site will offer three reload bonuses each week to players, although the initial bonus which will kick off the promotion will be a whopping 100% up to EUR 100 offer. This will be followed by two 50% bonuses, each worth up to EUR 100. Guts Casino will credit the weekly prizes to you on the following Monday. The free spins won are wager-free, although the casino bonuses have wagering requirements of 25 x.
Wow what an amazing offer! So many great prizes to win!